We're an Australian owned company looking after people who like to look after themselves. We're down-to-earth in our attitude and we're simply all about tasty food that's free from key allergens like gluten, wheat, dairy and nuts. We opened our doors in Melbourne in 1990. We like to think of ourselves as food pioneers, so much so, we helped establish specific health sections in Australian supermarkets as a one-stop shop for people seeking 'free from' food. Actually more than just that, for people seeking food with tons of wholesome benefits. In 2009, Freedom Foods established a dedicated 'free from' factory in Stanbridge in the beautiful New South Wales Riverina (near Leeton.) To say that we are 'home proud' is an understatement. That's because we've created one of the few factories around the world that is free from wheat, barley, triticale, sesame seeds and nuts. How can we be so sure? Well we manage the process of sourcing our ingredients, in some cases actually milling them ourselves. Therefore we can say 'free from' with complete confidence. These days, it's not enough to be health-conscious, we also need to be allergen-conscious. For over twenty years we've been making great-tasting, nutritious and allergen-free food. We believe everyone deserves great food that is free of the things you don't need and full of the things you do. 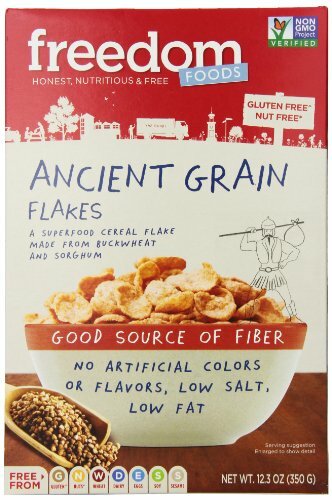 Sorghum is a wholesome and versatile ancient grain which is rich in nutrients and has been used for thousands of years. Quinoa contains magnesium and fibre. This gluten free superfood has a high protein content and provides all essential amino acids. It is renowned for being rich in fibre, B vitamins and antioxidants. Looking for a fructose free breakfast to start your day? We have it sorted, With a delicious mix of cereals seeds and 3 super grains (quinoa, sorghum and millet), freedom foods 3 ancient grains super muesli is your answer. If you have any questions about this product by Freedom Foods, contact us by completing and submitting the form below. If you are looking for a specif part number, please include it with your message.